EP | ¿Son eficaces los probióticos para tratar el cólico del lactante? Authors’ conclusions: urinary neutrophil gelatinase-associated lipocalin is sufficiently accurate to identify urinary infection in infants. Further studies are needed to confirm this and determine if it is more cost-effective than the usual screening tests. Reviewers’ commentary: urinary neutrophil gelatinase-associated lipocalin is shown as an adequate biomarker and similar to those currently available for the diagnosis of urinary infection in infants. Extensive and cost-benefit studies are necessary to recommend it as a first choice for the screening of urinary infection in infants. Authors’ conclusions: among preterm infants, delayed cord clamping did not result in a lower incidence of the combined outcome of death or major morbidity at 36 weeks of gestation than immediate cord clamping. Reviewers’ commentary: among preterm infants, delayed cord clamping did not show differences in the rates of death or major morbidity versus immediate cord clamping, so it could be an option to be considered in the birth of these children, and could be assessed by the clinician in each individual case. There were some differences in other tertiary variables that will need to be confirmed in future studies. AVC | Are antidepressants useful for functional abdominal pain? Authors’ conclusions: patients had more response to serotonin reuptake inhibitors than to tricyclic antidepressants, independently of the associated psychiatric component. They give little importance to the gastrointestinal symptoms caused by the drug that could be the cause of the withdrawal of the medication. Reviewers’ commentary: antidepressants appear to be effective for the treatment of functional abdominal pain, with a therapeutic advantage of serotonin reuptake inhibitors over tricyclics. However, given the methodological limitations of the study, the lack of concordance with other available data and the high percentage of adverse effects, it seems prudent to wait for larger and higher quality studies to be able to recommend its use in this functional pathology. Authors’ conclusions: control of spasms at three months was significantly better if initially treated with prednisolone. Control of spasms at six and 12 months was not significantly different despite a trend favoring prednisolone. Risk of relapse following initial remission was similar in the two groups. Reviewers’ commentary: oral prednisolone versus intramuscular ACTH is equally effective for the control of spasms in West syndrome, being a more accessible medication that can be administered by caregivers. In addition, the treatment costs are lower without increasing side effects. AVC | Rolandic epilepsy and cognitive dysfunction, is it really a benign entity? Authors’ conclusions: children with rolandic epilepsy display a profile of pervasive cognitive difficulties. These results challenge current conceptions of this kind of epilepsy as a benign disease or of limited specific or localized cognitive effect. 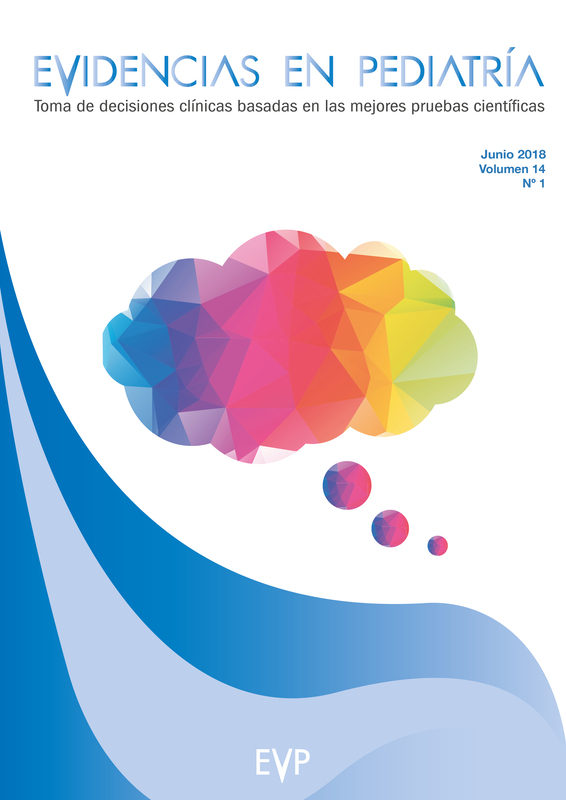 Reviewers’ commentary: although the limitations of the study make necessary to assess with caution the magnitude of the cognitive dysfunction in rolandic epilepsy, it seems clear that this association exists. Pediatricians have to be especially alert in these patients for the early detection of cognitive dysfunction in order to initiate interventions that improve their prognosis. Author’s conclusions: sustained increases of central-peripheral temperature differences are an early sign of evolving late-onset sepsis. Reviewers’ commentary: thermal gradient monitoring is a non-invasive, easy to implement procedure and requires only standard NICU equipment. Given its diagnostic value and the evidence of reduction in the mortality rate for sepsis episodes obtained with its application, we recommend the implementation of this method in NICUs in their early sepsis detection programs. Authors’ conclusions: no single finding reliably differentiates pneumonia from other causes of childhood respiratory diseases. Hypoxia and increased respiratory work are more valid signs than tachypnea and auscultatory findings. Reviewers’ commentary: some clinical signs, separately or together, may be useful in the diagnosis of pneumonia. Tachypnea, a sign classically recommended by the World Health Organization, is less valid than other signs. The auscultatory findings, probably due to their subjectivity, are not valid findings. However, this study does not allow us to assess the performance and safety of a diagnosis of pneumonia exclusively based on clinical findings. Authors’ conclusions: compared with the landmark technique, ultrasound guidance was associated with an increased first-attempt success rate, a reduced number of puncture attempts and fewer complications during central venous catheter placement in critically ill children. Reviewers’ commentary: percutaneous placement of a central venous catheter is performed with fewer attempts, with fewer complications and with greater success in the first attempt, if it is guided by ultrasound. It seems to be more beneficial in inexperienced hands and in certain anatomical locations, but these data should be handled with caution, since they are coming from subgroup analysis. AVC | Is topically applied liposomal lidocaine effective for preventing vaccination pain? Authors’ conclusions: liposomal lidocaine decreases pain during vaccinations in infants. The observed treatment effect may not be sufficiently important to change clinical practice, particularly in light of the short-lived nature of the pain. However, consideration should be given to the possibility of adding lidocaine to reduce the burden of pain. Reviewers’ commentary: the use of an association with topically applied liposomal lidocaine plus sucrose decreases pain associated with immunization in children younger than 6 months of age. The magnitude of the analgesic effect is lower than the one obtained with breastfeeding.